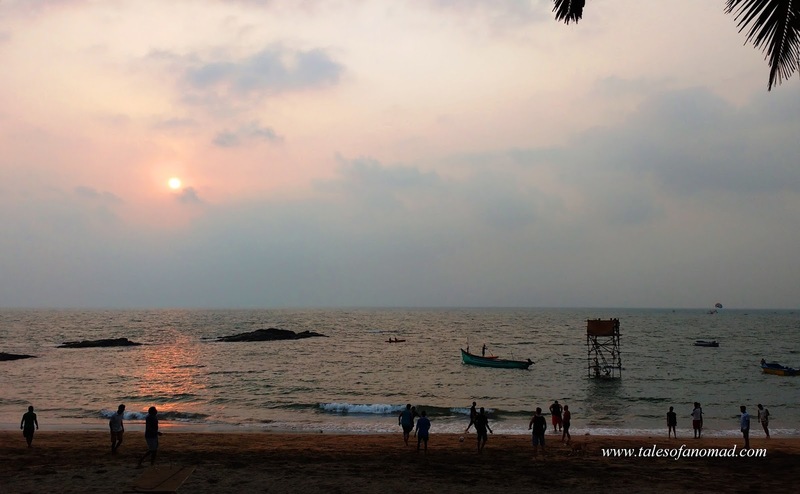 Tales Of A Nomad: An Evening in Anjuna! It was yet another beautiful sunset as the day came to a close. There was a random game of football, people climbed a temporary structure and dived into the waters, a juggler displayed his skills, a few played frisbee, a couple held hands and took in the sea breeze, the waves gently kissed the sands, moored boats swayed to the tune of the tides, trance music played in the background and the sun went down the horizon. Loved the vibe that the wonderful evening offered. Bliss! Curlies beach shack, Anjuna beach, Goa. March 2017. Wish it had remained like that forever. This really refresh my school and college days memories. This is a perfect destination of bachelors(you know what I mean). And I am so obsessed with this place, that I never say no when any of my friend plan a trp. Glad it rekindled your lovely days in Goa. The sun setting into the sea. A sight one'll never get tired of.